IEAP NOW ACCEPTS ONECOIN + EUROS VIA THE NEW DEALSHAKER PLATFORM! 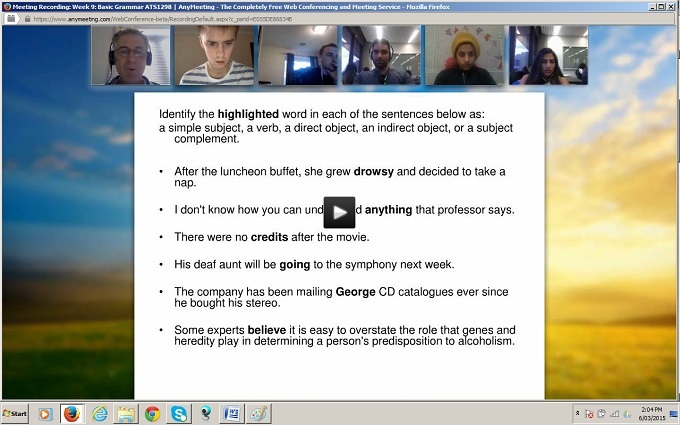 Webinars are interactive online 'meeting' places! They can allow participants to see and chat with each other or to attend an online "class" or seminar, after which participants can ask questions and offer comments. They are a GREAT way to provide instruction in a whole range of different areas, especially anything related to language-related training, and especially if there are exercises and answers to be checked! It's like being in a meeting or a classroom, except that IT'S ALL ONLINE! It can actually be a lot of fun and just in case the connection drops out, it's always possible to reconnect quickly and there's always a very helpful archive of the session which you can then download for future reference if you'd like. Our FREE IELTS webinar, for example, has already been enjoyed by IELTS test hopefuls from around the world who say they have learned a lot about preparing effectively for the test from the 45 minute presentation and discussion. Many have then gone on to enroll in the rest of the webinar program (AUD$75.00). or complete the contact form HERE or below. These are the webinars we are currently offering., we run the FREE introductory session EVERY WEEK so you can get a sense of how they work and how beneficial the FULL PROGRAM can be in your IELTS PREPARATION, UNIVERSITY STUDY, BUSINESS ENGLISH or the increasingly popular webinars we are running for ONLINE MARKETING enthusiasts!